My crappy little Twitter poll isn't conclusive of course, but it mostly agrees with my priors based on anecdotal evidence, so I think it's probably mostly right. Finding profs willing and able to teach Intro well is not easy. It's low status (and economists dumping on "Econ101" doesn't help); it doesn't help with your research (which is what gives most status and career advancement); and some profs are not good at teaching large classes and explaining things simply and clearly to students who might not be natural economists and who don't know much math. And if more than half the profs in a department (Macro profs are a minority) aren't comfortable teaching the Macro half of Intro, this makes it harder. (This can be ameliorated only partly by having Micro profs teach only Intro Micro and not Intro Macro). As K D said in reply to my Twitter poll: "How in the heck can a person have an econ phd and not understand the basics of both? We all passed qualifying exams. An Econ PhD should be capable of teaching intermediate in both, IMO." He's got a point. Something's not right. It is a puzzle that needs to be explained. But the puzzle is the asymmetry. I think this problem has always been there (at least in the 40 years I have been teaching Intro), but suspect it's been getting worse over time as the content of graduate Macro has become more different from the content of Intro Macro. All teaching benefits from having an intuitive feel for the subject you're teaching. But this is more true for Intro than for more advanced courses in economics. Because the students themselves, being (mostly) new to economics (some have taken it in high school), don't yet have an intuitive feel for the economic perspective, and it's your job to teach it to them. When you are teaching Intro you are going to get all sorts of questions coming out of left field, and you have to do your best to answer them; you can't just crank through the model and point to the equations. Teaching Intro is not like passing a PhD comprehensive exam (though that might say something about PhD comp exams). Macro profs "get" Micro; Micro profs don't "get" Macro. Macro just feels weird to them. Yes of course this is a gross generalisation, to which there are many exceptions. But I think there is a real asymmetry here. It's got nothing to do with Macro being about "the economy as a whole" and Micro being about parts of the whole (which we sometimes misleadingly tell our Intro students when trying to explain the difference between Micro and Macro). Yes Macro is (mostly) about "the economy as a whole", but a lot of Micro is too. And Micro profs are comfortable thinking about General Equilibrium as well as Partial Equilibrium. It's got nothing to do with Money as Unit of Account. Microeconomists are perfectly comfortable treating any good as numeraire, so if you tell them the numeraire is money, because that's what real people use as numeraire, they're fine with that. I think it's about the role of Money as Medium of Exchange. Which makes general equilibrium, and general disequilibrium when some prices are "sticky", very different from a barter economy or one with a central Walrasian market where any combination of goods can be swapped with any other combination of goods by all agents meeting simultaneously in one big market. If my hunch is right, then Micro profs should feel more comfortable teaching the Long Run Growth theory part of Intro Macro, because Long Run Growth theory ignores monetary exchange. It's the other part of Intro Macro -- Short Run Macro -- that they won't feel comfortable with. Microeconomists: do you think I'm right about that? "Micro starts out with Scarcity and Choice. Then it talks about how people Gain From Trade (exchange), and Markets and Supply and Demand. And you can get Gains From Trade even in a pure endowment economy with no production. But if you add Comparative Advantage (Ricardo) and Economies of Scale (Adam Smith) you motivate Division of Labour in production and the Gains From Trade get even bigger. And what Micro says about all that is important. But Macro adds that trade is very difficult if you don't use money to buy and sell goods. And if something goes wrong with the supply or demand for money, this can make trade more difficult in all markets in which money is used. So some of the potential Gains From Trade are lost, which makes people worse off, and reduces the amount of goods produced. A shortage (excess demand) of money, for example, can reduce demand in all markets where money is used to buy whatever is being sold in that market. And that's a big economic problem." So I'm asking Microeconomists in particular: if we introduced Short Run Macro that way, would it make more sense to you than Y=C+I+G+NX and Saving and Investment and Income and Expenditure and Aggregate Demand and Aggregate Supply? On your hypothesis: "And Macro is weird because Macro (often implicitly) assumes monetary exchange and Micro doesn't." That may well be correct, but isn't the explanation I would have given. WIth micro, or at least with pre-behavioural econ, pre-empirical revolution micro, it's always clear how to approach a problem. Figure out who the relevant economic agents are. Figure out what their interests and constraints are. Then ask "what would an rational, utility maximizing individual do?" It's typically clear what model to use - and if there's a debate (e.g. in the minimum wage literature), it's clear why people disagree, and how what kind of evidence would resolve the debates. Macro's not like that. The behaviour of a million economic agents isn't a million times the behaviour of one economic agent. It's not obvious that - except in very general terms e.g. demand curves slope downwards - that individual rational choice helps to explain macro phenomena (real business cycle theory anyone?). In this blog you tell micro stories to motivate your explanations of macro phenomena - but they're stories. Then in the comments someone might tellh a different story. They're both fables, parables. How am I going to chose between your story and someone else's story? On the basis of literary criticism? The last paragraph, when you introduce money to explain recessions, makes a lot of sense to me. Explaining things like that would help, at least for me. But monetary theory is the only kind of macro that's ever made any kind of intuitive sense to me. But getting back to your original motivation for this post - let me suggest a very different, but not totally unrelated explanation. Macro economists have very little data against which to test their theories. Macro economists also, as noted above, have more types of explanations than microeconomists do. Both of these things mean that, in macro, persuasion becomes incredibly important - it's not "here is a randomized control trial involving 300,000 people that shows I'm right" it's more "let me explain to you why I'm right." So I think this causes a particular type of person to select into macroeconomics . If you asked both macro and micro economists "are you comfortable teaching introductory political science" I bet you'd get a similar confidence gap. Economists never retire Nick. They simply converge to a new equilibrium point. Thanks Frances. I hope more Micro profs will comment. "The last paragraph, when you introduce money to explain recessions, makes a lot of sense to me. Explaining things like that would help, at least for me." That's what I hoped to hear! "But monetary theory is the only kind of macro that's ever made any kind of intuitive sense to me." I wonder if that's because when we do monetary theory we are explicit about the role of money; but when we do Income-Expenditure and Aggregate Demand/Aggregate Supply we are less explicit about the role of money? "If you asked both macro and micro economists "are you comfortable teaching introductory political science" I bet you'd get a similar confidence gap." I didn't see that one coming! I wonder? Livio: I expect I'm searching for that new equilibrium point. But it will involve more slacking off, and a lot less planning. Nick - "a lot less planning." All these years you've been working to a plan? Frances: OK, a lot less *pretending* to plan! BTW, n=1, even though I am very Macro, I am actually slightly less comfortable/confident teaching Intro Macro than Intro Micro. Congratulations on the retirement, Nick! I'm not an economist or even someone with formal economics training, but I have followed your posts here at WCI for six or seven years now. In that time, your elegant, intuitionist explanations of macroeconomics have helped cement my own thoughts on macroeconomics and general equilibrium, and in particular it's helped me see through seductive-but-flawed heterodoxies like MMT. For purely selfish reasons, I hope you'll continue to contribute to WCI into your retirement. Your explanation is strange - money is brought in to help trade then you immediately start talking about it hindering trade. The fundamental problem (as you know) is the problem of triangular trade - Adam has apples, Betty has bananas and Chin has coconuts/Adam wants bananas, Betty wants coconuts and Chin wants apples. Barter is in equilibrium, but it’s a *fake* maximum. Barter stability isn’t the same as true stability. Adam can get bananas by offering a contract that he will pay out a coconut (which he can buy with an apple). If you don’t emphasize the inefficiency of barter equilibrium, you end up looking like a “sticky prices” guy. But what you mean to say is that inefficiency of macro disequilibrium it forces you into the suboptimal barter equilibrium. There’s a good analogy to public goods. Let’s say you provide a public good with a tax and you use a Pareto vote - one no and it doesn’t happen. You moght say “This will be inefficient because of noise voters.”. But the efficiency of this mechanism is lower bounded by the (no public goods) pure market equilibrium. The inefficiency of a bad public goods provision is that it forces you into the suboptimal pure market equilibrium. I hope you enjoy your retirement as well! PS. What’s the distinction between Aggregate Demand and the flow of money? Majro: Thanks! I will probably continue posting on WCI. But the really nice thing about retirement is that your time becomes a much more liquid asset. You can spend it on anything, on a whim. Much less pre-commitment. "Your explanation is strange - money is brought in to help trade then you immediately start talking about it hindering trade." I wasn't clear enough. Money helps trade. But when money is not working well, if doesn't help trade as much as it should, even though it still helps, because barter is (usually) even worse. Some trades don't happen. "PS. What’s the distinction between Aggregate Demand and the flow of money?" Not much. Except we normally restrict "Aggregate Demand" to refer to the demand for newly-produced final goods, while the flow of money is in exchange for everything that gets traded for money. Micro is a solid, cogent set of ideas that was carefully developed over several centuries. Macro was a desperate and doomed attempt to explain the Depression. Bad theories, inconsistent with micro and not even internally consistent, spouting nonsense like Y=C+I+G, AS/AD, IS/LM, and MV=Py. So the solution is easy: Ditch macro, keep micro. Mike: Ha! I actually have some sympathy with that view. Unfortunately, the questions that motivate Macro (and that precede the name "Macro"), won't go away, and we need to try to answer them as best we can. What causes business cycles? Under what conditions, if any, will something like Say's Law actually work in a monetary economy? What determines the inflation rate? Etc. I think the answer to the question of why microeconomists feel less comfortable teaching intro macro is in your post, but it's a simpler explanation than the one you offer. Since, as you point out, macro is rarely taught well, microeconomists don't have the layers of additional macro that macroeconomists have to get comfortable with intro macro. And I agree that intro macro isn't taught well, typically. Those questions that you mention can easily be explained without macroeconomic hocus pocus. Slumps happen because of money shortages, which in turn happen because of bank runs, or because of government policies that restrict the money supply. Booms happen when those restrictions on the money supply go away. Say's Law only appears to be violated when money shortages make trade difficult. Inflation happens when the money issued by the central bank outruns the central bank's assets. The main problem with Marshall-era macro is that it was based on the quantity theory, rather than the real bills doctrine. When guys like Marshall saw the money supply rise 10%, they expected the price level to rise by 10%. When prices stayed the same (because backing for that money had also risen by 10%), they were left scratching their heads, and that opened the way for lame theories about sticky prices, failures of aggregate demand, etc. Personally, I believe micro as a foundation for macro is more or less wrong footing macro. Micro deals with the optimal use of resources while macro deals with the level of the use of resources - barely compatible missions. However, while micro is relatively easy to understand, the fallacy of composition makes a mess of macro. Anyway, I hope you find the optimal and full use of your resources in retirement and the fallacy of composition intrudes not at all. Another explanation could be the big gap between undergrad and graduate-level macro. In my experience they are almost completely different topics. All the grad-level macro I saw involved solving dynamic optimization problems, basically micro + time (and not a lot of discussion of money). I can hardly remember the undergrad stuff now. Michael: " And I agree that intro macro isn't taught well, typically." Because the textbooks don't teach it right? Mike: But that *is* Macro (under another name)! Well, maybe it's better to say that Micro and Macro are intertwined, and need to be taught together (somehow)? Brad: yes, I think that has increased the problem over time, and also made some younger macro profs less comfortable teaching Intro Macro too. Instead we could keep referring back to MV=PY, and actually use it to build a model. For instance using the identity to show how increases in MV will raise both prices and output in the short run, but only prices in the long run. We could use it to explain why real economic growth is deflationary, other things equal. Instead we teach the Phillips Curve, where money is hidden and growth is inflationary. In micro we teach students not to reason from a price change, and then in macro we engage in reasoning from a price level change, an interest rate change, and exchange rate change, etc. We teach students that easy money causes inflation, that inflation causes higher interest rates, and that easy money causes lower interest rates. Huh? Even worse, we teach that lower interest rates imply that money is getting easier. We teach them that the AD curve slopes downward for reasons that even I find hard to understand, whereas we could just teach that the AD curve is a given level of nominal spending, which shifts whenever nominal spending changes, whenever M or V changes. If I were a microeconomist I'd hate teaching macro. Having been retired for 5 years, I strongly recommend; I hope you enjoy it a lot. And I also want to thank you for helping me understand macro and the issues involved in approaching it in a coherent manner...wish I'd found this blow considerably earlier. rsj: is that the SF Bay Bridge? I lived in Berkeley one year, ages ago. 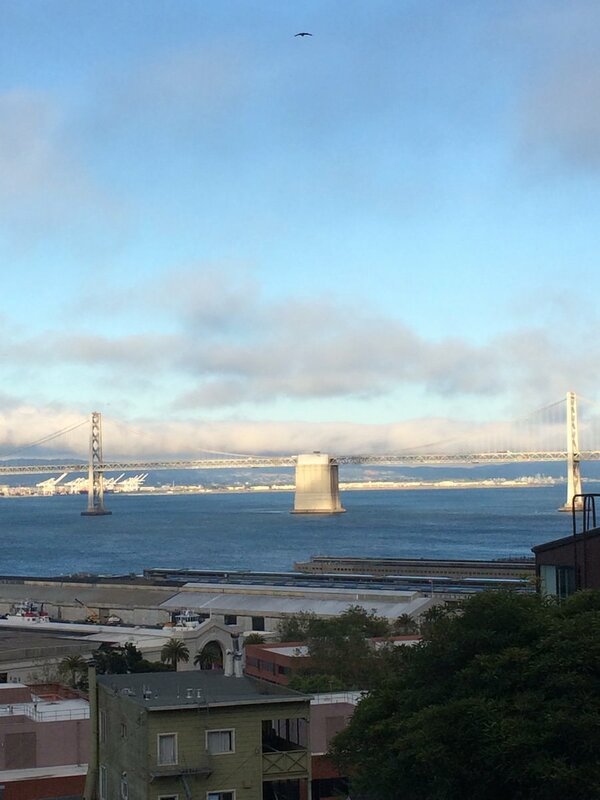 Could *just* see the Golden Gate out of the apartment window, on a rare clear day. It was beautiful. Would like to drive highway 1 again, all along the Pacific coast. Scott: thanks. "But many of our models hide money." That I think is the problem, in a nutshell. Thanks Donald. On thinking it over, maybe the biggest problem with my post is not paying enough attention to the possibility that Macro profs might feel uncomfortable teaching Intro Macro too. Happy retirement, Nick! It has been a long time since I taught intro macro, and my only recent exposure to it is job market lectures of candidates for teaching professor positions. My usual response is "what is going on?". Part of this is that the lectures can be drawn from anywhere in the course, but more is because I don't remember, or understand, the precise reasoning behind the pictures and the handwaving. I think macro is very hard, and I work better when I can read the footnotes. "My usual response is "what is going on?"." Reminds me of the old days at Western. Roger Farmer and I have very different interpretations of "what is going on" in the Intro Macro Keynesian Cross diagram. Even though we must both have learned it as undergrads in the UK at the same time, and took all the same money/macro courses as grad students, and are both Macros. Nobody knows what is going on! Wow, you have a good eye! Yes, the bay bridge. Highway 1 is awesome. Actually, the US has two Highway 1s. One along each coast. 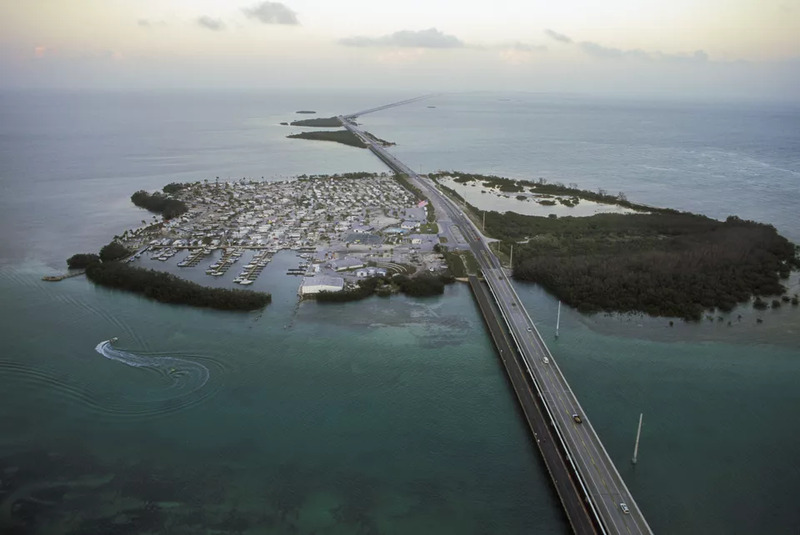 The 1 on the east coast goes all the way down the Florida Keys to Key West, which is a fantastic drive. The Florida Keys are awesome. Really, Florida is amazing. You can boat through the everglades, see the art deco buildings on south beach, see amazing architecture in Brickell, see the pop art in Wynwood, go to Key Largo for scuba diving and snorkling -- they have a barrier reef there. And of course all those little island beaches. I've been there three times and would go again. Whenever I need to unwind, Miami has recently been my go-to spot for relaxation and enjoyment. Nick, it's been a peck of fun following your exploits thru this medium. You have a truly unique way of approaching problems that I wish I could employ; alas, I'm stuck with my ways and my brain and follow a little closer to standard. Your way is better. Have fun in retirement, Nick! I think the source of most of the problem is that economists are not educated in the restrictive assumptions needed to prove general equilibrium as in Arrow-Debreu. And how general equilibrium theory died in the failure to find general equilibrium for even slight divergences from the constant-cost functions needed for perfect competition. I.e. economists are ignorant of fundamental micro theory. It is not the absence of good micro-foundations for macro that is the problem. At root the problem is that we do not have good micro-foundations for understanding an actual micro-economy, and most economists are not trained well enough to be aware of this. This is apart from the additional factor that in most of the real world scale matters. One analogy is insisting upon predicting the weather on the basis on idealized characteristics of individual nitrogen atoms. It is not done, and a scientific attitude rejects adherence to rigid small-scale modeling. Or in the world of home chemistry, scaling up simple baking recipes will usually fail if scaled up beyond a doubling. Clinton - interesting comment. If Nick doesn't respond, it'll be because he's away from the internet for a couple of days. Plenty of good Econ 101 textbooks out there. All the Prof has to do is assign the chapters and explain the bits. Seems like an easy task. "Well, maybe it's better to say that Micro and Macro are intertwined, and need to be taught together (somehow)?" I wish someone could explain how. Micro is about optimization and optimal use of resources - i.e. given a constraint, where can we sit on the production possibility frontier? The constraint is defined at a given level of income which allows full utilization of resources. If the economy is working at a level inside the PPF, the constraint is meaningless and an optimal solution cannot be found. The problem is how can we get the economy working on the PPF (full employment) and why would it maintain that level of resource utilization? The second problem is, if the economy is working below the PPF, how did it get there and why does it stay there? I can't see that micro can answer these questions. This is one of the many delusions of the representative economist. Fact is that micro is proto-scientific garbage and macro is proto-scientific garbage and the synthesis of the two is proto-scientific garbage squared.#1 This is state-of-art economics and teachers teach it and students swallow it. Economics is for 200+ years now what Feynman called a cargo cult science. Clinton: Are most economists unaware that you can't get competitive equilibrium with Increasing Returns to Scale? I would have thought that most knew that. But even if true, why would that make teaching Intro Macro especially hard for micro profs? HC2 introduces marginalism which is the all-pervasive principle of Orthodoxy. HC2, though, and HC4 and HC5 are plain NONENTITIES, that is, they have not more reality content than the Easter Bunny, dancing angels on a pinpoint, the Tooth Fairy, or Pegasus. The methodological fact of the matter is that ALL models that take JUST ONE NONENTITY into the premises are a priori false. And methodology tells us that if the premises are false the whole analytical superstructure is false. Therefore, the standard microfoundations approach with all its variants and derivatives from Jevons/Walras/Menger up to DSGE is methodologically false. To put NONENTITIES into the premises is the defining characteristic of fairy tales, science fiction, theology, Hollywood movies, politics, propaganda, cargo cult science, and microfounded economics. Teaching/studying behavioral optimization, just like teaching/studying epicycles, is a thing of the proto-scientific past. Teaching/studying Walrasian Micro and Keynesian Macro is a thing of the proto-scientific past. Time to end the shrunken heads perversity called economics.